Do you love Mexican coffee spiked with cinnamon? And do you like cookies? 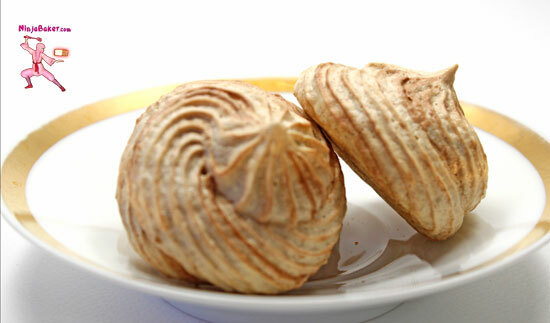 If you answered yes to both questions, my Cinnamon Coffee Meringue Cookies are for you! Inspired and adapted from the Mocha Meringue Cookies at Cookie Dough & Oven Mitt. Set your oven to 250 degrees. Whip up the egg whites in a stand mixer. When frothy and bubbly - which happens almost immediately - add the salt. Followed by the cream of tartar. Sprinkle in the espresso and cinnamon next. As the egg whites start to form peaks, pour the sugar in one tablespoon at a time. Drizzle in the coffee extract. When stiff peaks appear, stop the mixer. Carefully pour the chocolate syrup into a prepared piping bag with a large star tip. Next, transfer the meringue mixture into the piping bag. Swirl meringue cookies onto parchment lined cookie sheets. Turn off the oven and crack the door open for 30 minutes. Enjoy with or without a cup of cinnamony Mexican coffee.